Several years ago, I was with my mother while she was cooking and we started up again. Scones, tea, jolly-good whatever. I was taking a Creative Writing class at the time and was in deep contemplation about the often asked question, “Is this poetry?” I sat at the kitchen table and started writing down the things we said, then adding things. It was totally hokey, and may or may not be a poem. When I was finished with it, I read it aloud to her, changing the accents. Oh, did we laugh. She had me call my sister and read it to her. Oh, those were fun times. The great thing is, they are still happening. We are lucky, indeed! 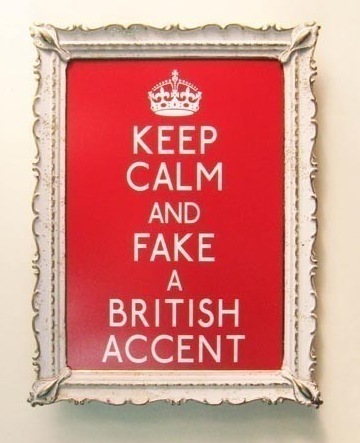 for someone to break out in an English accent. we are indeed English not Irish as family legend claims. ripped from the pages of a Regency romance. Would you care for a scone with a wee bit of clotted cream? even Eliza Doolittle would cringe. beginnings in the Yorkshire dales. nearly careened into her with his sporty new cabriolet. My deepest apologies, Mum. T’won’t happen again. dismissing a suspect’s bloody claims of innocence. This entry was posted in Creative Writing and tagged Be Calm, Carole King, carry on, English, Fake British Accent, Pygmalion, singing by Liza. Bookmark the permalink.